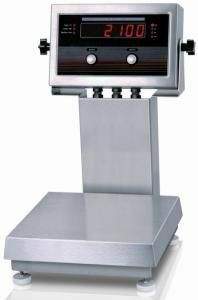 Rice Lake Weighing System checkweighers are made to handle the toughest of jobs. The stainless steel platform is enhanced with a four-point spring plate suspension to help minimize and absorb the shock and any overload damage. Which is ideal for situations where items are constantly being transferred onto and off of the scale. Display: Six-digit Light Emitting Diode (LED) display. Seven-segment, 0.8 in (20 mm) digits. The checkweigher load cell is aluminum, increasing corrosion-resistance and life expectancy in wash down applications. Offering stainless steel buttons that will not only repel messy spills, but that can withstand sharp knife point contacts or other abrasive treatment. The durable NEMA 4X stainless steel indicator enclosure will also stand up to a frequent wash down environment. All operations on the indicator are administered through two push buttons which are zero and units which does offer full range for a variety of applications. Outputs are communicated on a large 0.8" Light Emitting Diode (LED) display. It is available in either 115 or 230 VAC. Please select which option meets your needs when ordering.